The Illinois Department of Revenue requires Illinois residents to file an annual income tax return. Income generated by individuals in year 2010 needs to be reported on 2010 form IL 1040. If you earn income in Illinois, the IL 1040 tax form is the next step after filing the federal tax return. Filing Illinois state taxes return is one of the inevitable necessities of your life if you live in Illinois. Illinois state taxes are reported on form IL 1040 which is due in April 15, 2010. The Illinois form IL 1040 2010 filing period is the same as your federal filing period. The Illinois tax code recognizes a number of categories of people who must file 2010 form IL 1040. Most tax payers fall into the "Illinois resident" category. If you are an Illinois resident, you must file Form IL 1040 if you were required to file a federal income tax return, or if you were not required to file a federal income tax return, but your Illinois base income (see line 9 of the form) is more than your Illinois exemption allowance. Another category is for example an Illinois resident who worked in Iowa, Kentucky, Michigan, or Wisconsin or in case you are a retired Illinois resident who filed a federal return. Part-year residents and non-residents must file 2010 IL 1040 form in many cases too. Other categories include for example the surviving spouse or representative of a deceased taxpayer, students, and nonresident aliens. See form 2010 IL 1040 instructions for a complete listing. When submitting the 1040 IL form 2010 by regular mail, your envelope needs to be post marked with the April 15, 2010 midnight or earlier timestamp. Form IL 1040 for 2010 can be filed either in print or electronically at the Illinois Department of Revenue web site. Filing your IL 1040 form electronically provides many advantages, such as that you can receive your refund in as little as 8-10 days. The Illinois state tax which you calculate on your IL 1040 2010 form is due on the same day as your tax return. To avoid costly errors on your tax return, it is often a good idea to use so called "tax software". Tax software will guide you through the tax process, and it will also help you to avoid computational mistakes. Nevertheless, tax software is usually limited if your situation is taxwise complicated. Illinois residents tax their net income (i.e. income after exemptions) with a flat rate of 3%. The marginal tax rate is therefore the same like the average tax rate for Illinois filers. In case you need help with calculating federal taxes (you need to have your federal tax return done to prepare your Illinois tax return), you can find more information at the tax calculator page. Many 2010 IL 1040 filers file also the Schedule ICR in addition to the 2010 IL 1040 form. This form is used to claim Property Tax Credit. Another form often filed by Illinois tax return filers is the Schedule ED which is used for claiming the Education Expense Credit. Many filers from the lower income level take advantage of the Earned Income Credit. To calculate your Earned Income Credit, complete the 2010 Worksheet IL 1040. 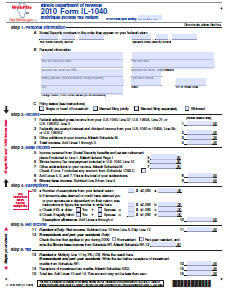 Do not forget to include any required attachments with your 2010 IL 1040 form. Forgetting to include appropriate attachments and schedules to your form IL 1040 can raise flags in the IRS validator. increase amounts of 50 to 99 cents to the next dollar. For example, $37.49 becomes $37.00 and $76.50 becomes $77.00. If you have to add two or more amounts to figure the amount to enter on a line, include cents when adding the amounts and round only the total. In case you need an extension to file your 2010 IL 1040 tax form, the state of Illinois will grant you a six month extension to file your return. However, this extension will not allow more time if you owe taxes. These extensions do not grant you an extension of time to pay any tax you owe. In case you owe state taxes, you must file Form IL-505-I (Automatic Extension Payment for Individuals). This will provide a payment extension beyond April 15th without having penalty and interest charges added on. Change of address on 2010 IL 1040? If you need to change your address that you use on your 2010 IL 1040 form, you can do so by completing the IL-1040 Address Change form at the Illinois Department of Revenue web site at the following address: https://www.revenue.state.il.us/app/iaci/. More information about filing your taxes on form 2010 IL 1040 can be found in 2010 form IL 1040 instructions.